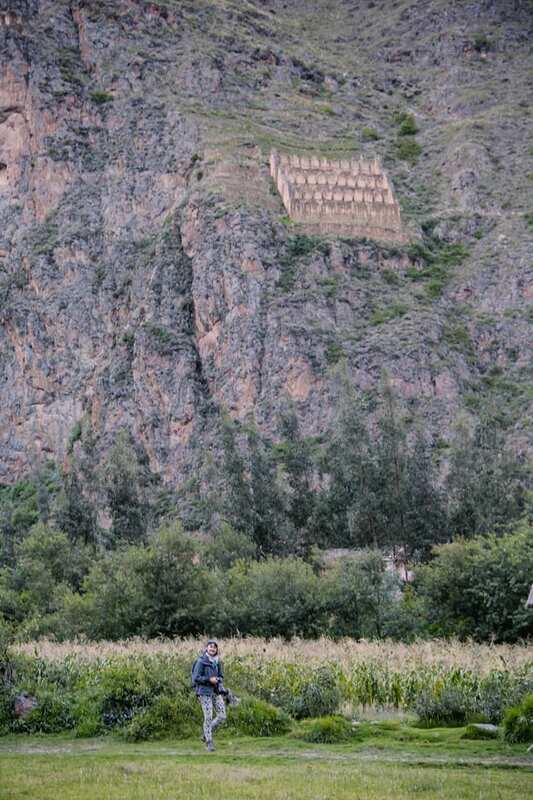 The Sacred Valley was our first port of call in Peru. 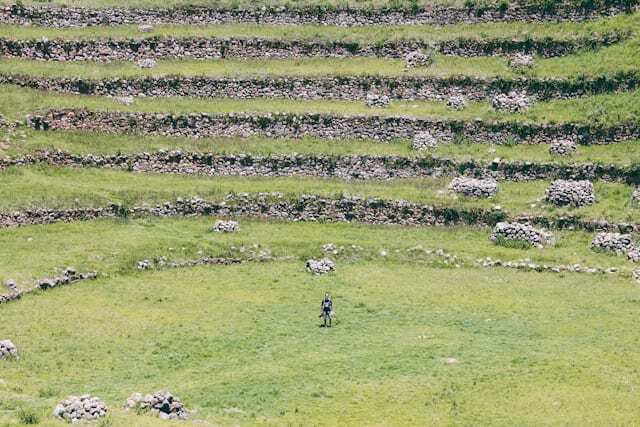 From the research we did it seems many people fly through the Sacred Valley on their way to Macchu Picchu. 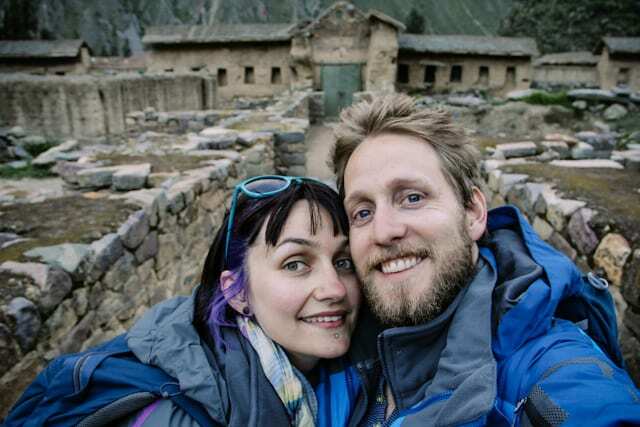 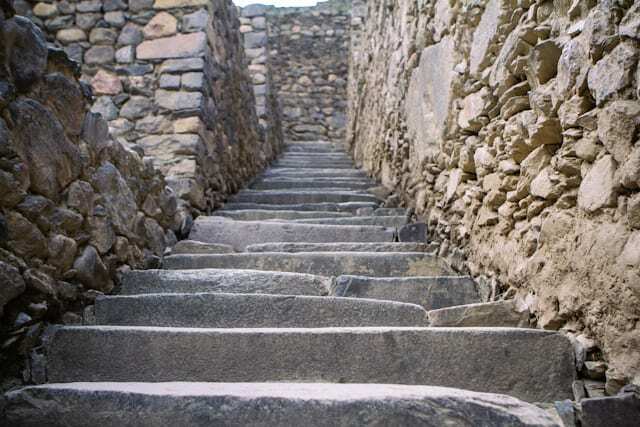 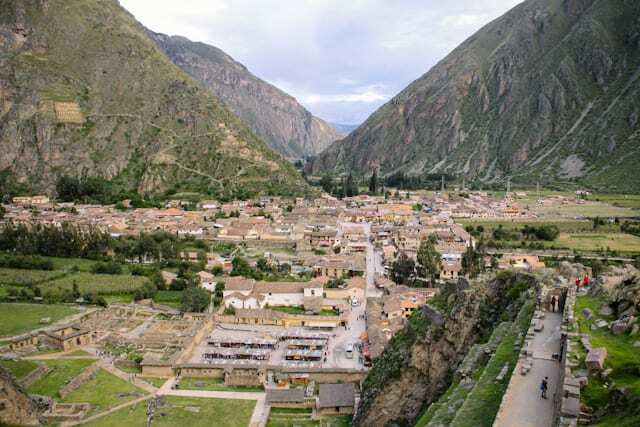 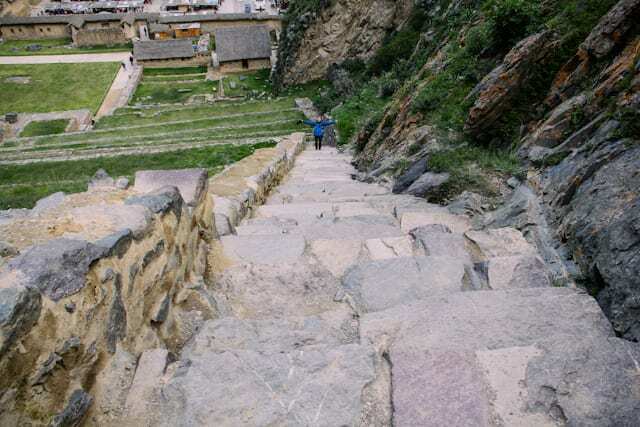 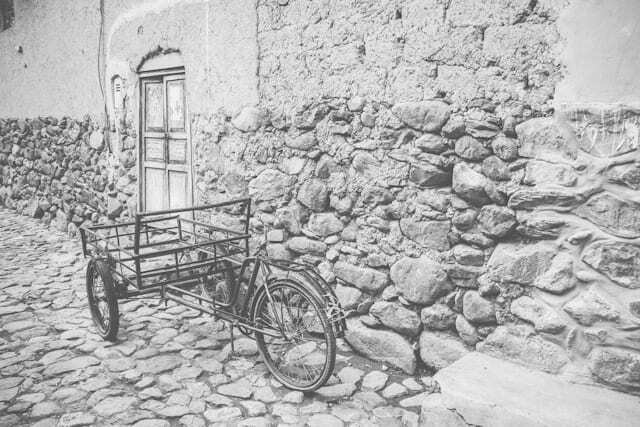 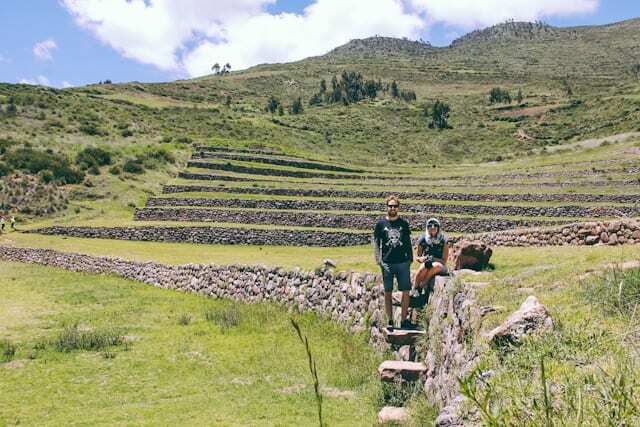 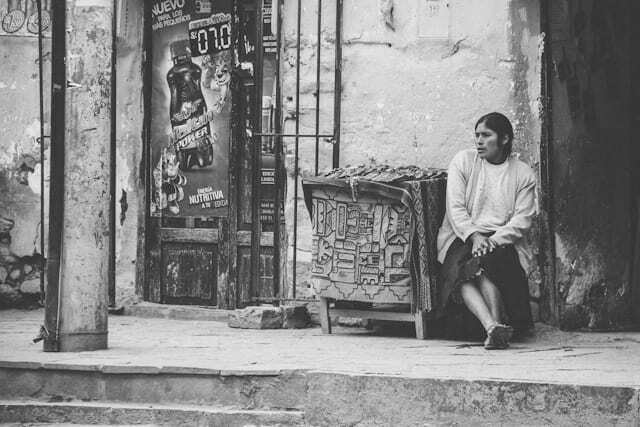 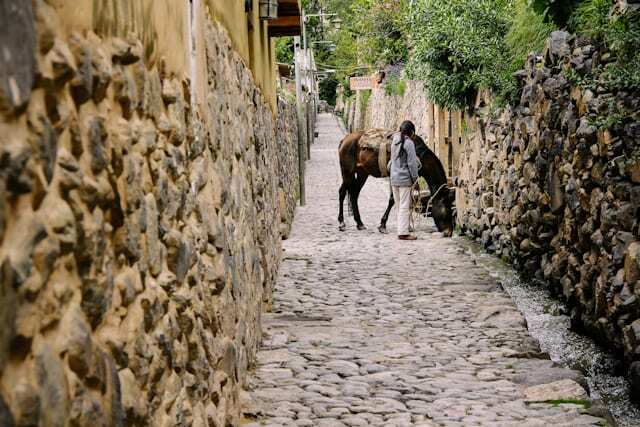 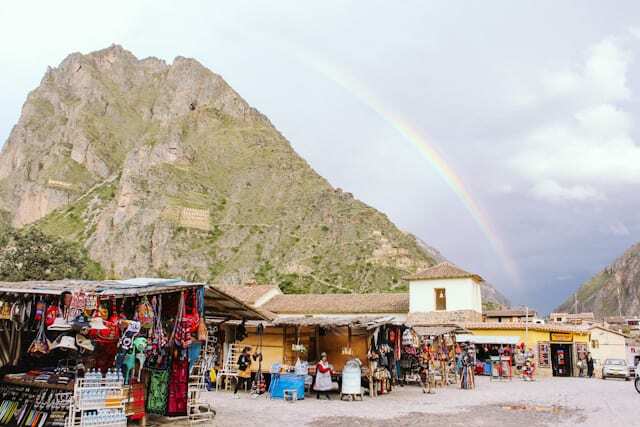 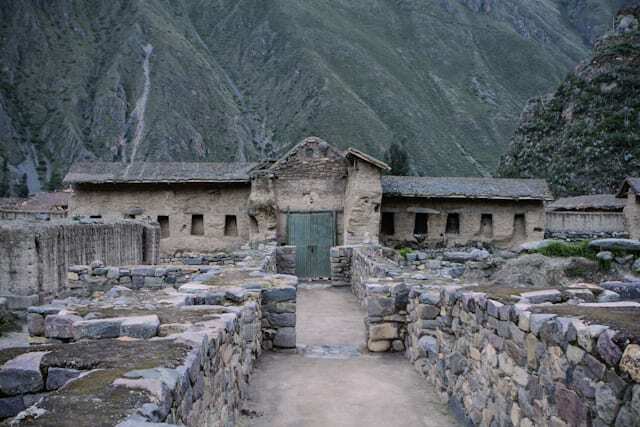 We decided to base ourselves in the Incan town of Ollantaytambo and used it as our base to explore the Sacred Valley. 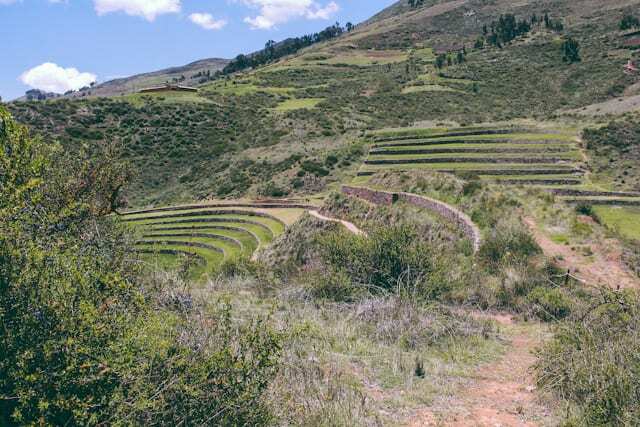 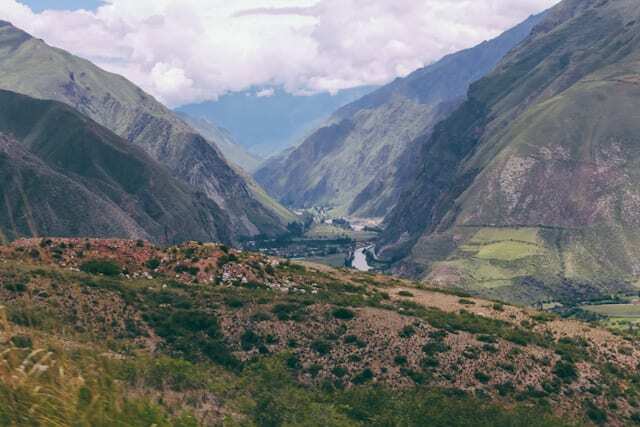 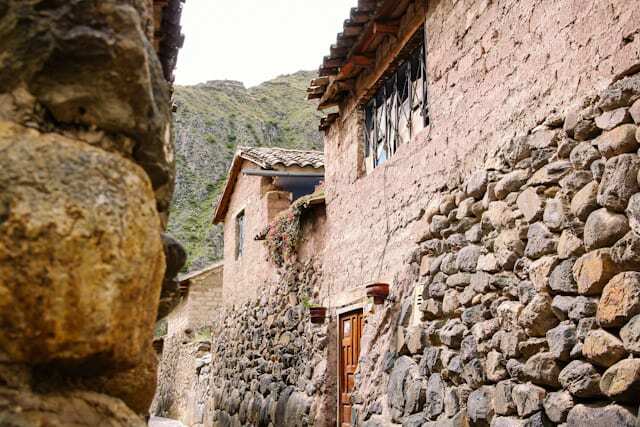 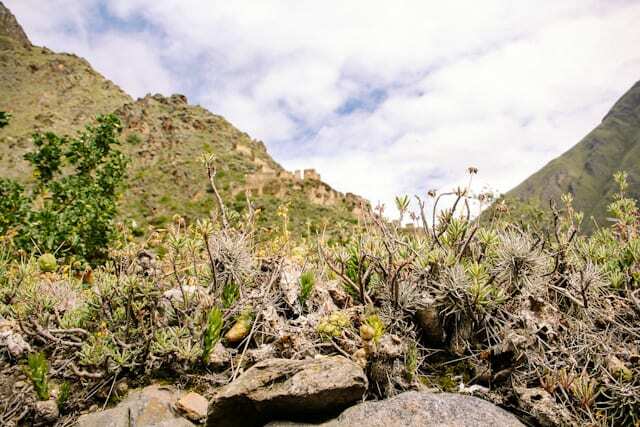 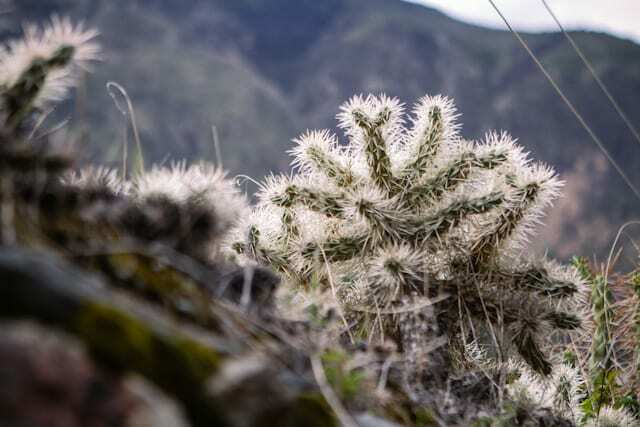 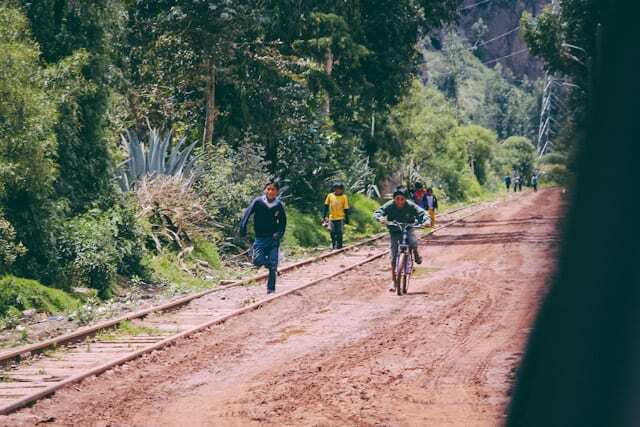 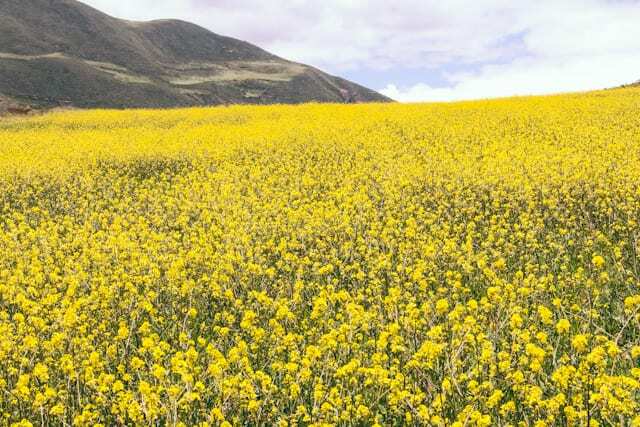 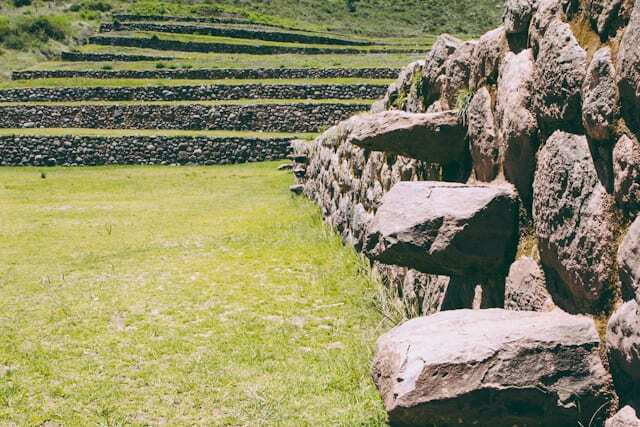 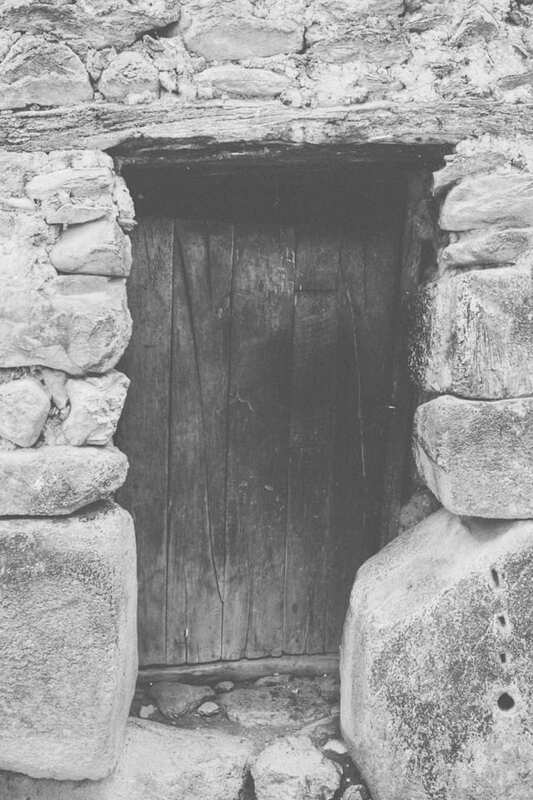 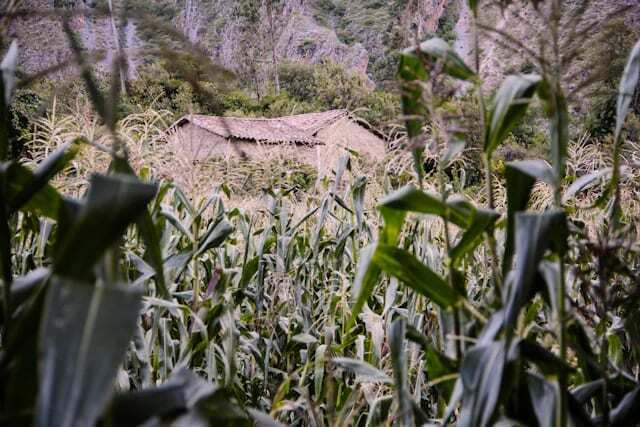 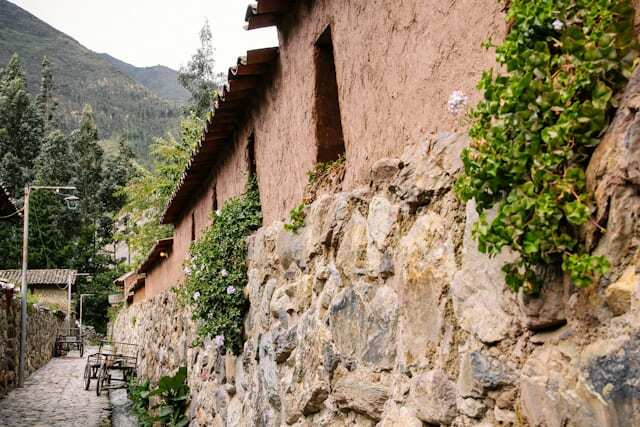 The Sacred Valley was not only exquisitely beautiful with the bulging Urubamba river flowing through the green mountainous countryside but is also steeped in both Incan and colonial history. 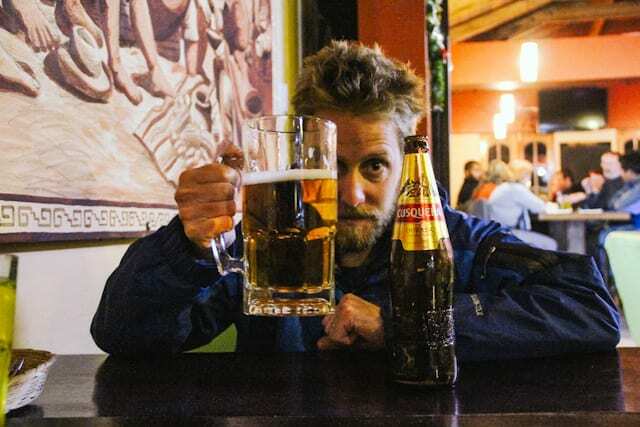 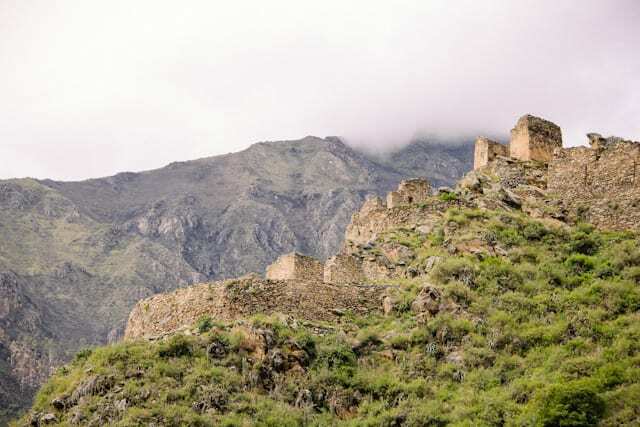 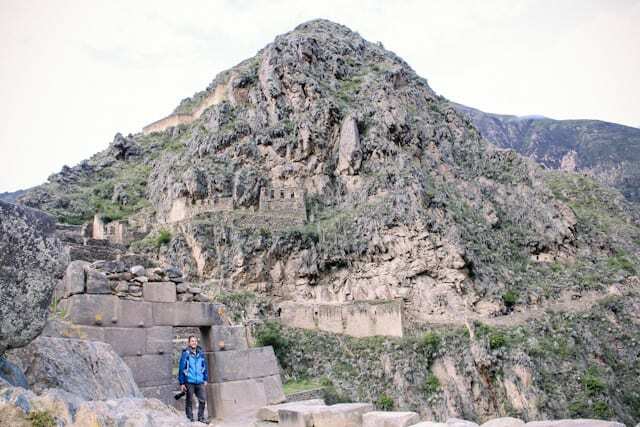 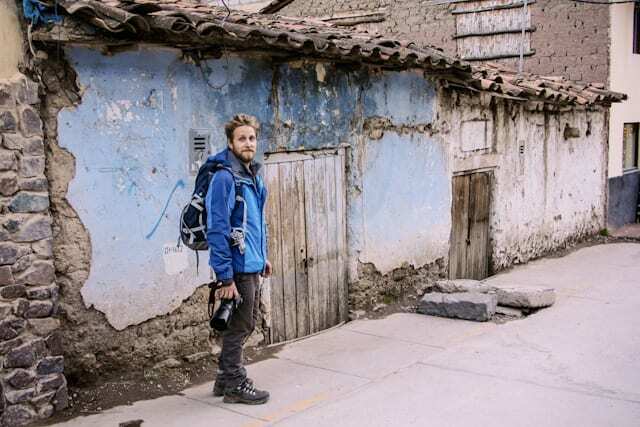 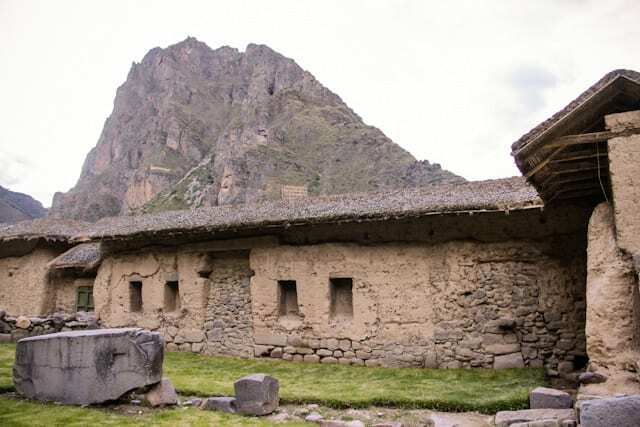 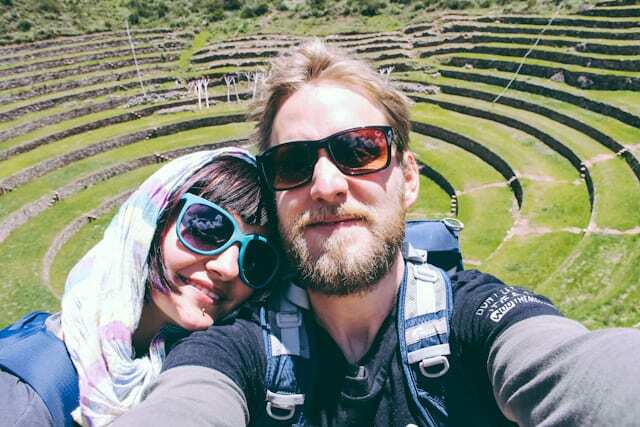 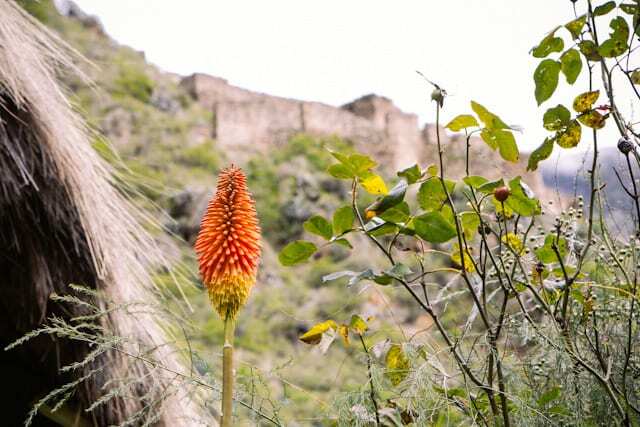 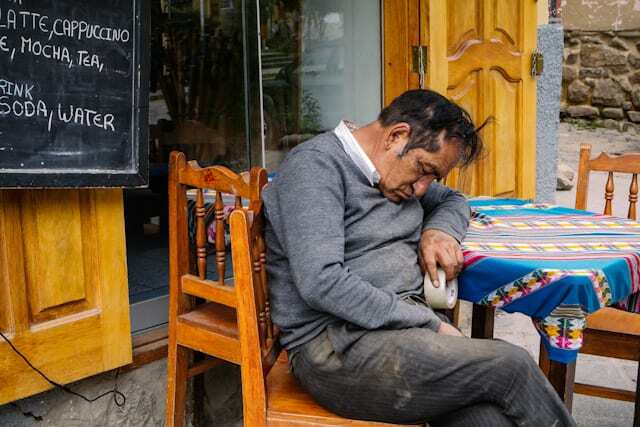 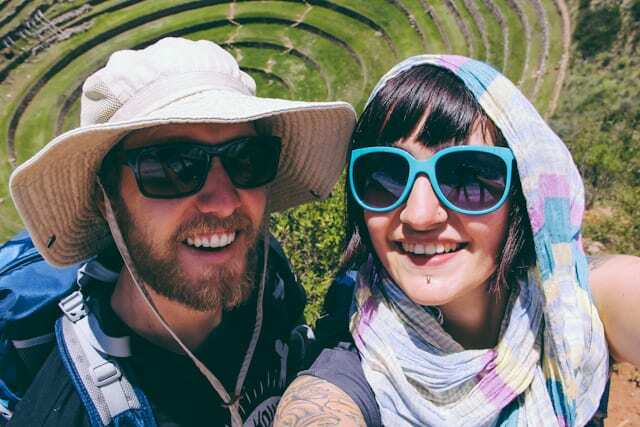 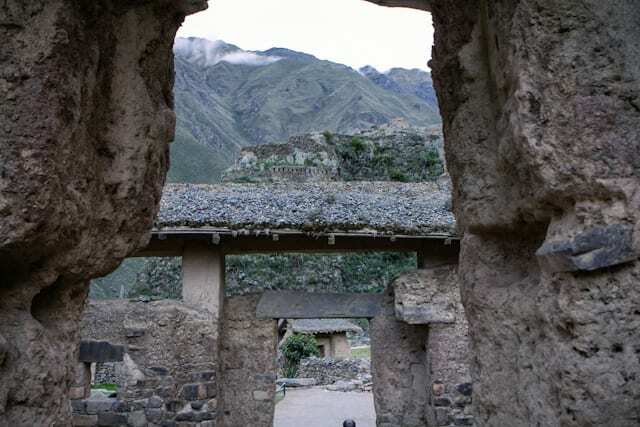 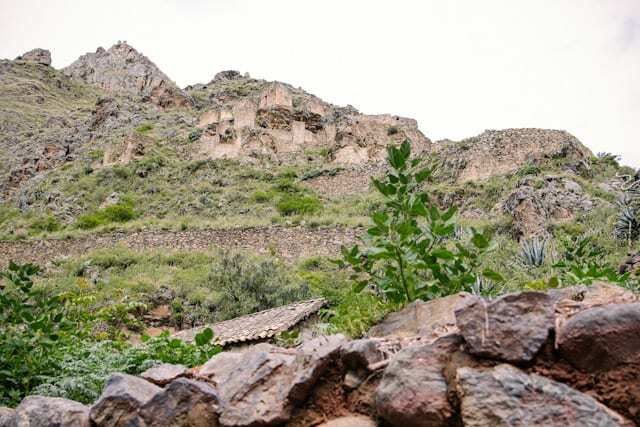 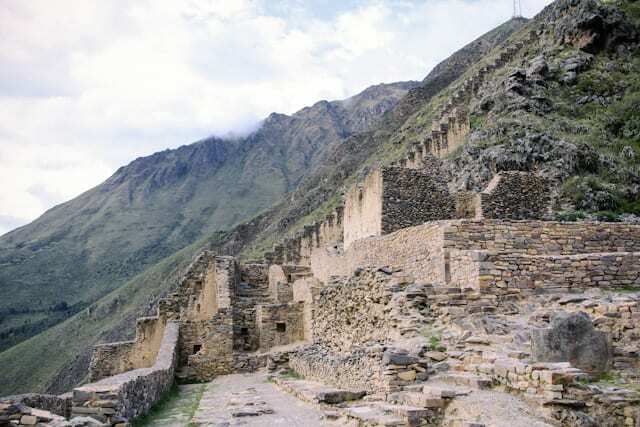 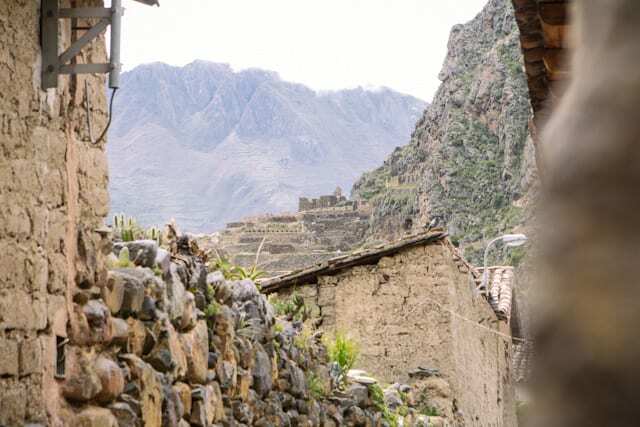 Our hostel was in an old Incan ruin and from our balcony we had views of the impressive Incan ruins that tourists flock to by the busful every day which were the location of last Incan stand against the blood thirsty Spanish. 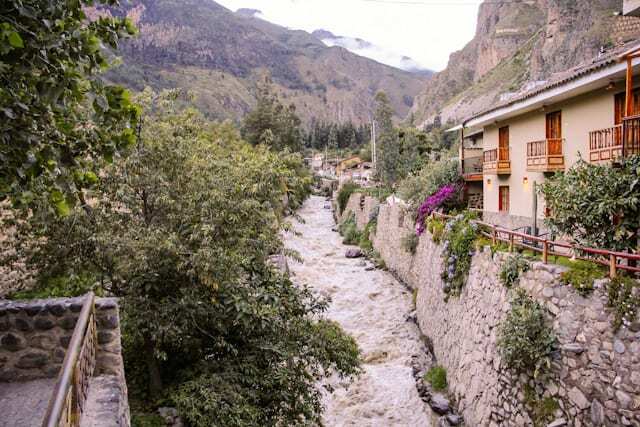 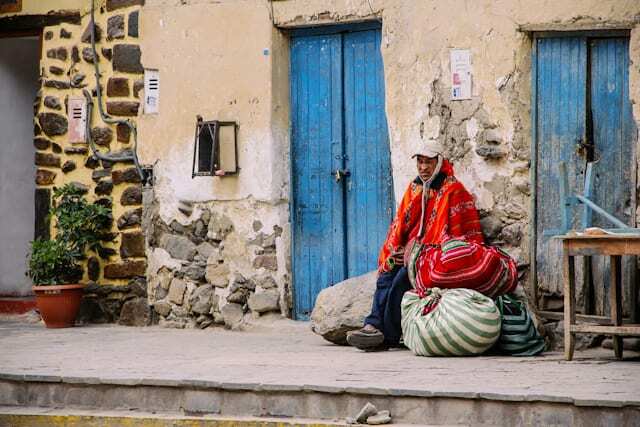 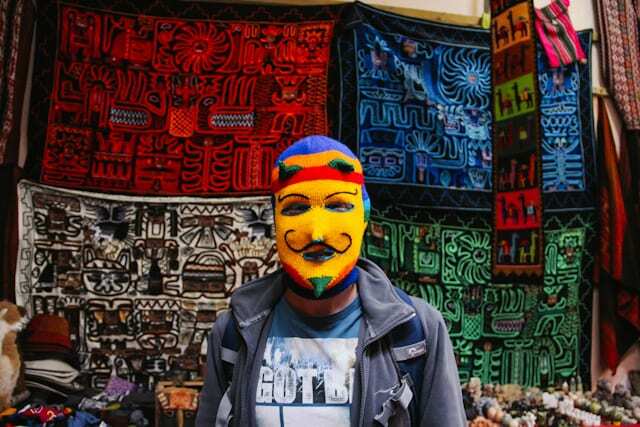 The town was remarkable and we spent ages just wandering around it looking at the impressive canal systems and gigantic Incan rock walls. 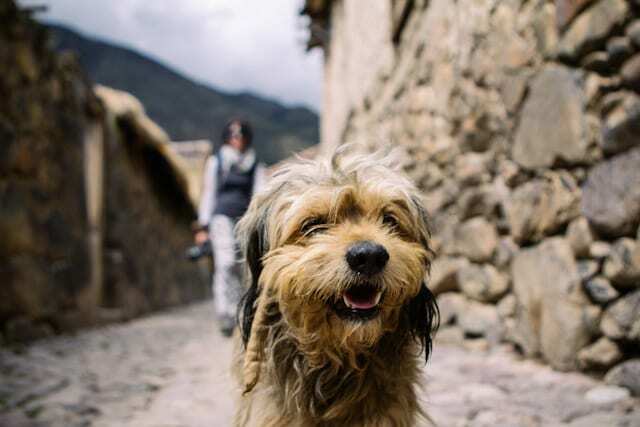 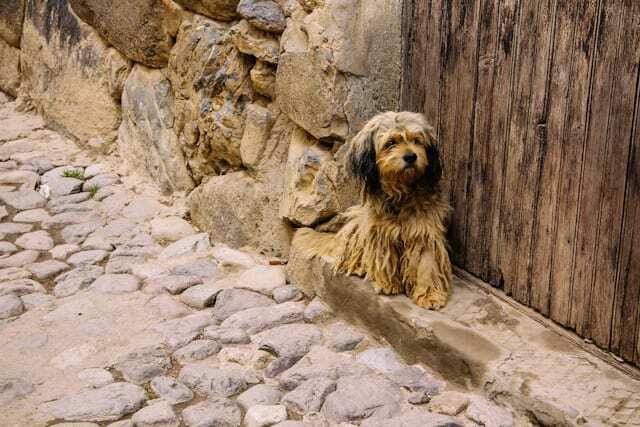 Peru and Bolivia were both filled with some of the cutest dogs we have ever seen! 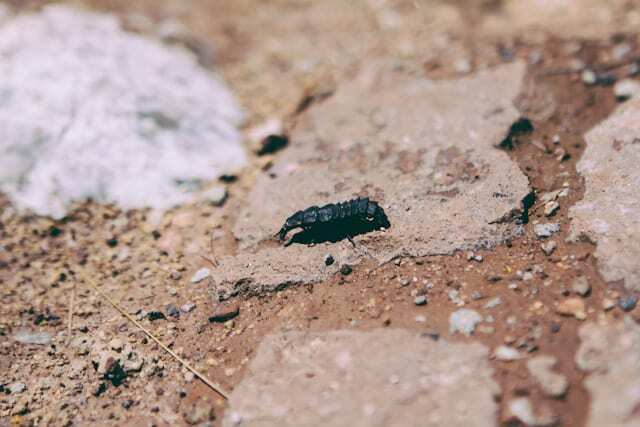 This little guy particularly caught Andy’s attention. 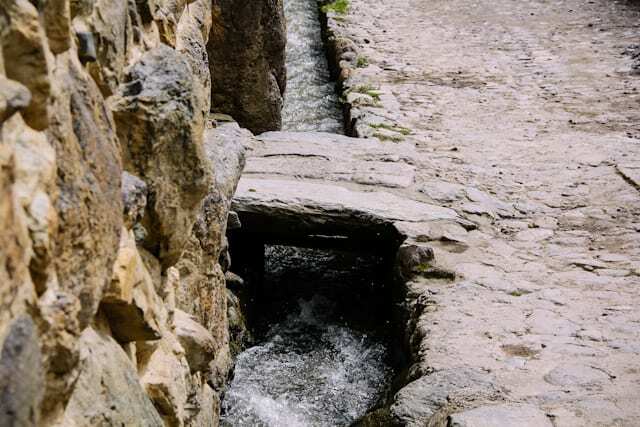 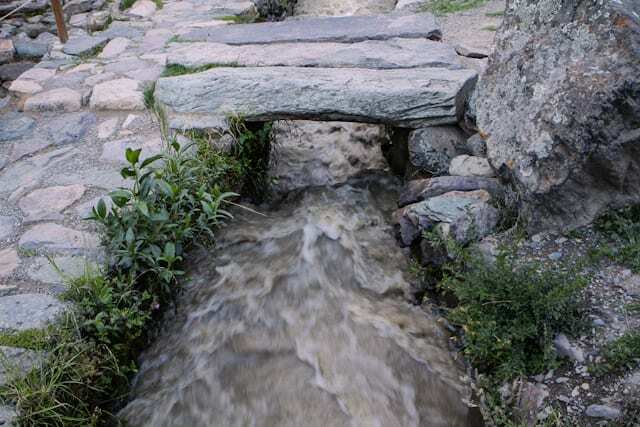 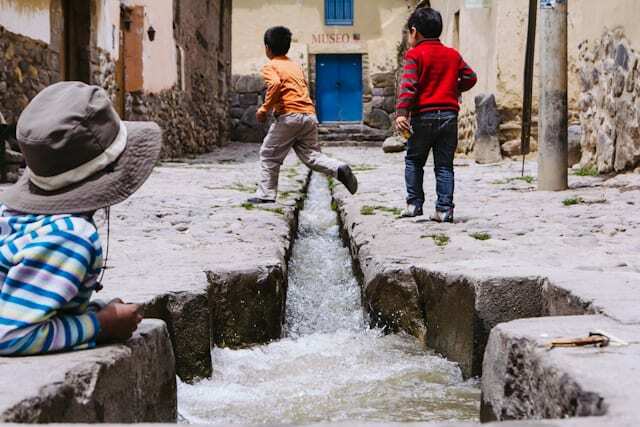 The centuries old canals built by the Incans and still flow with water. 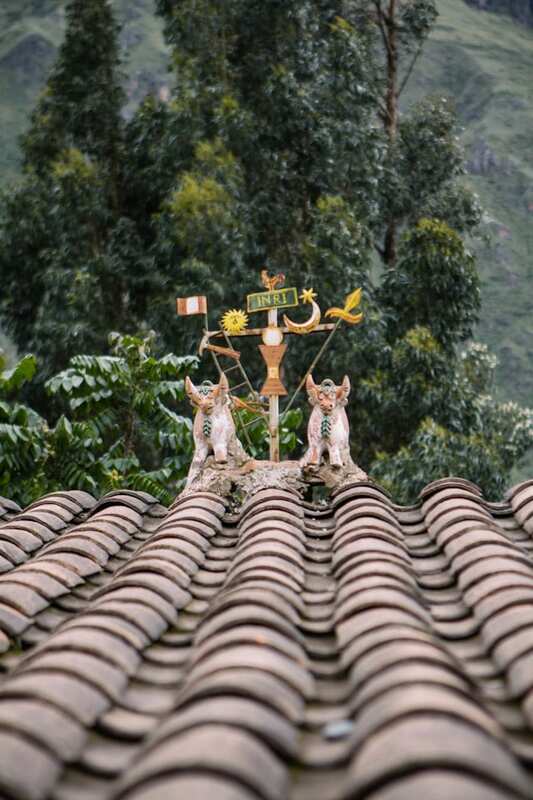 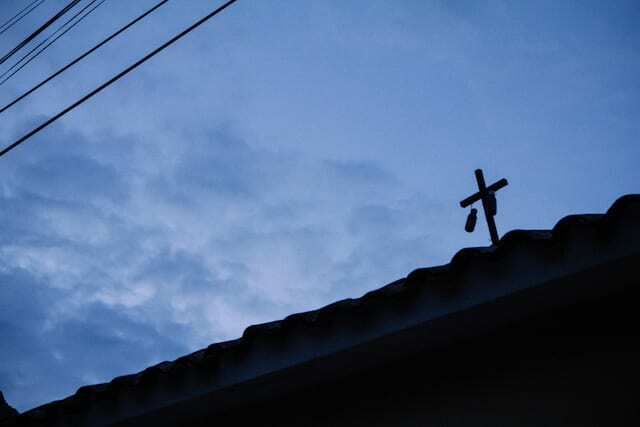 Most houses have these two bulls on top of them. 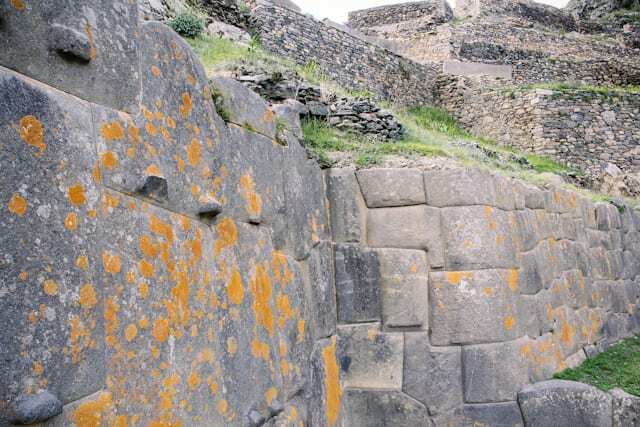 These were originally llamas but were changed to bulls and became Catholic symbols after the Spanish invaded. 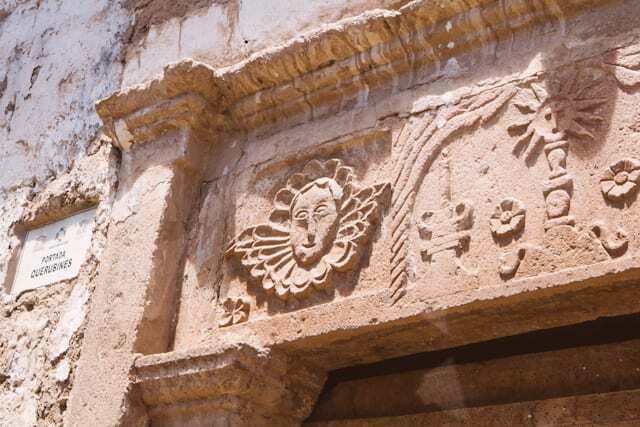 They are supposed to guard the house and protect it from the “evil eye”. 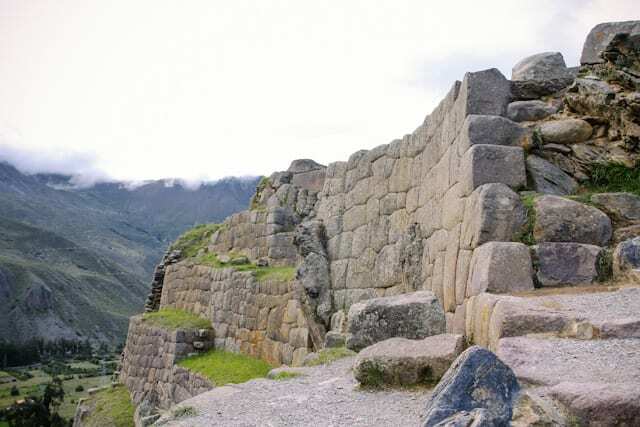 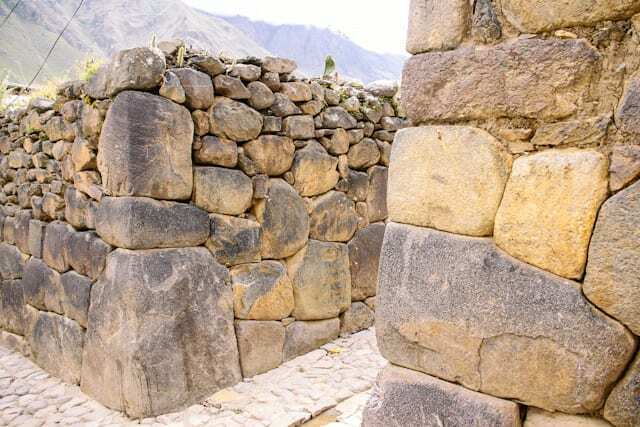 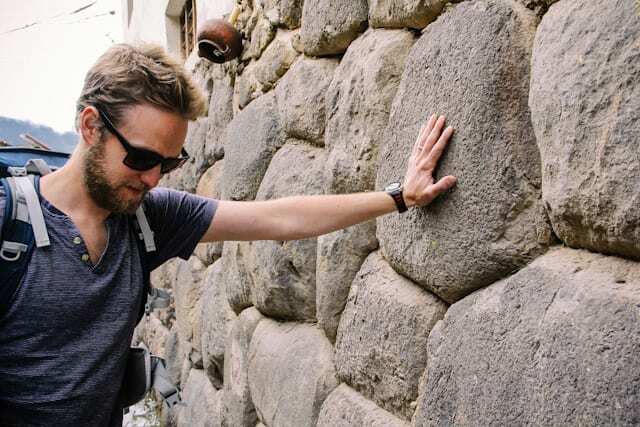 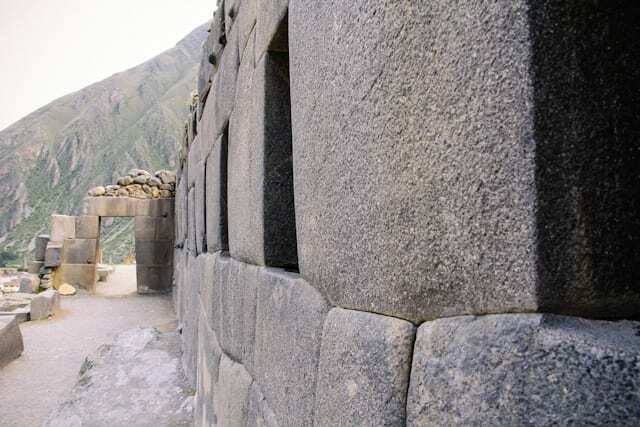 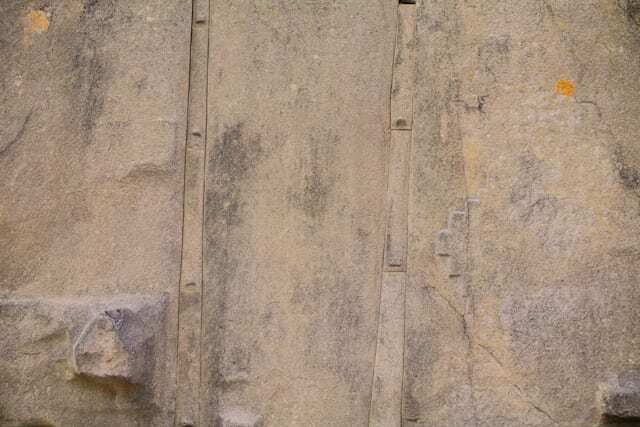 The insane Incan brickwork has still not been replicated even with the use of modern technology. 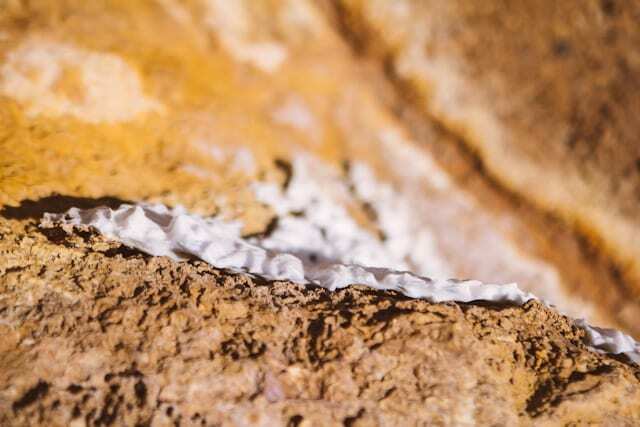 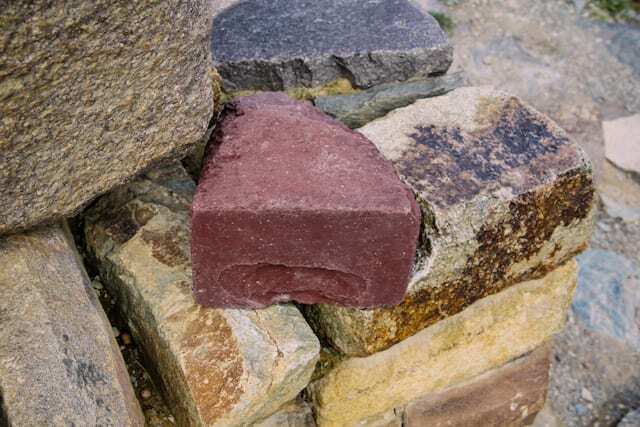 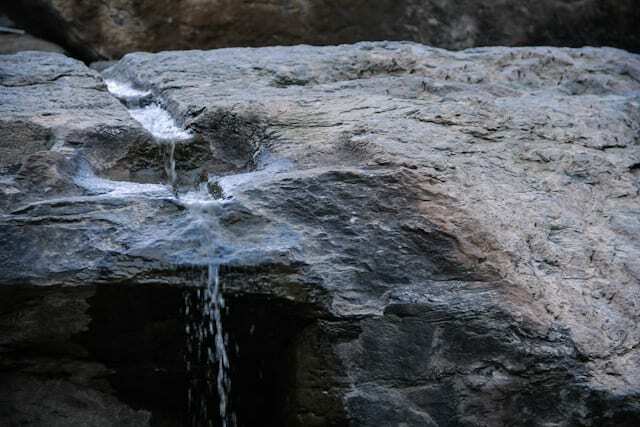 Some rocks are fused so perfectly that you caneven slip a piece of paper between the seams! 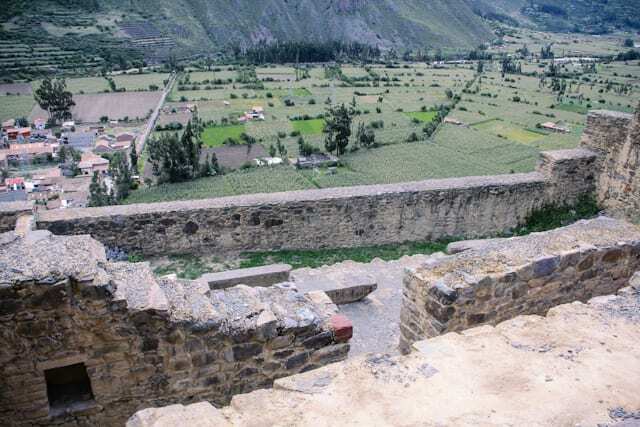 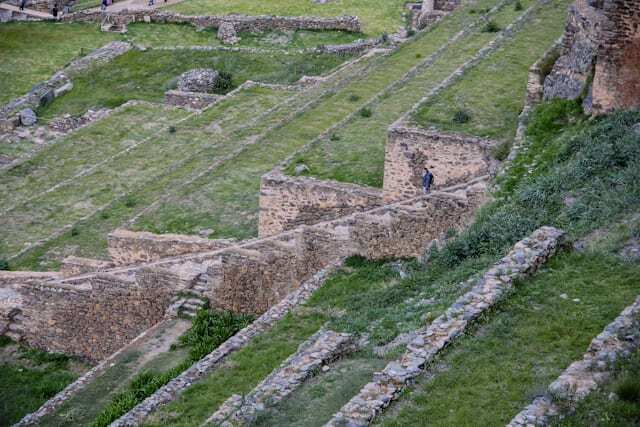 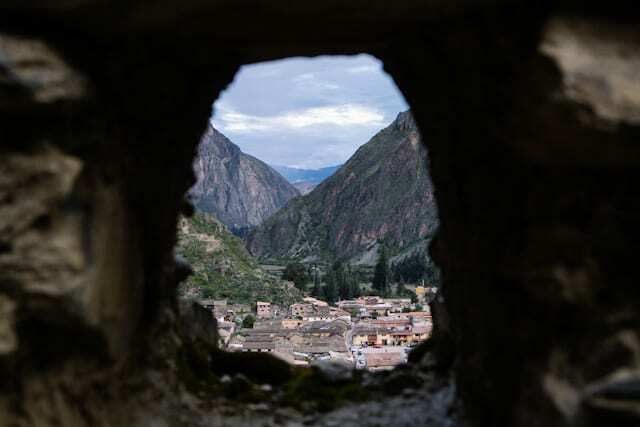 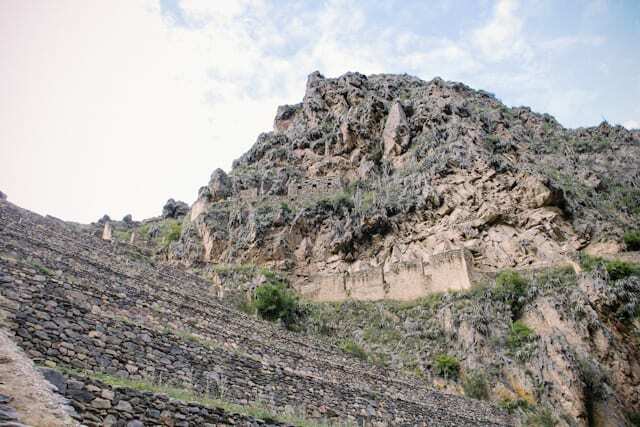 View of Ollantaytambo town from the ruins. 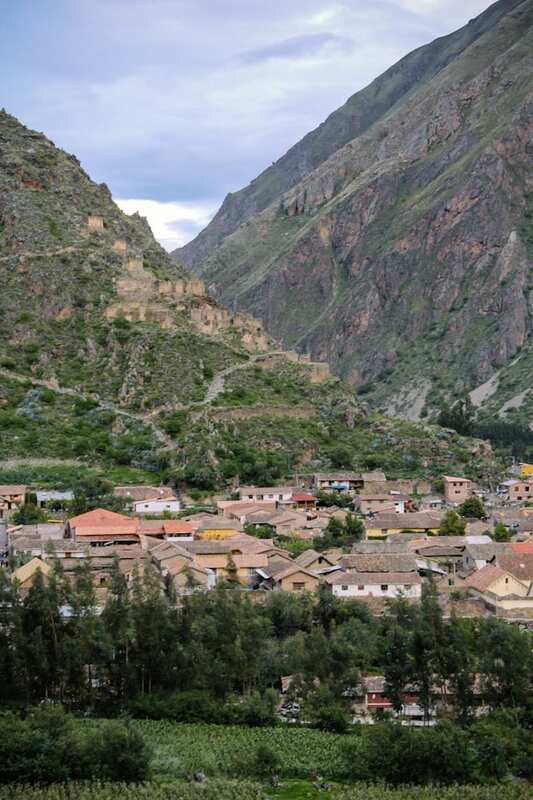 This was definitely one of our favourite towns we stayed in on our trip. 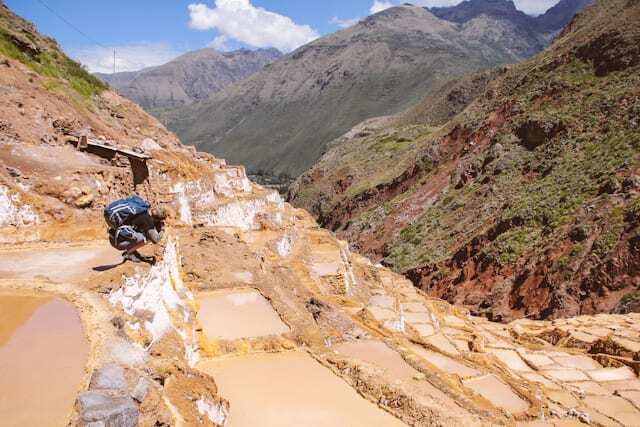 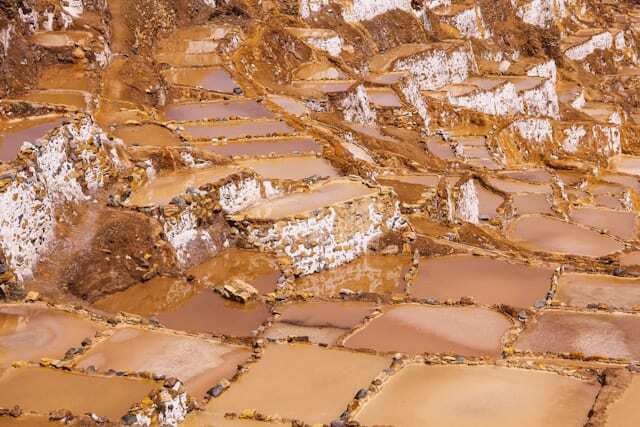 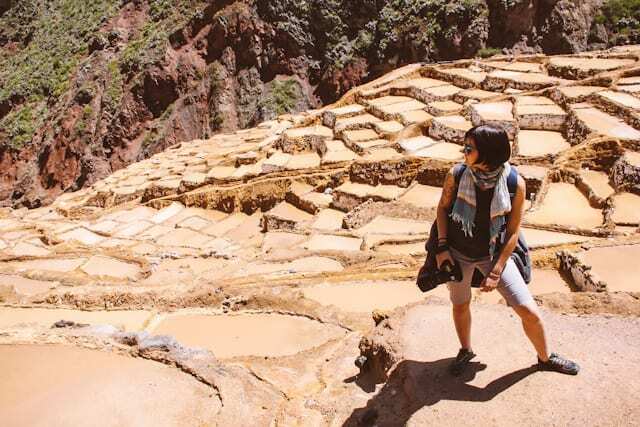 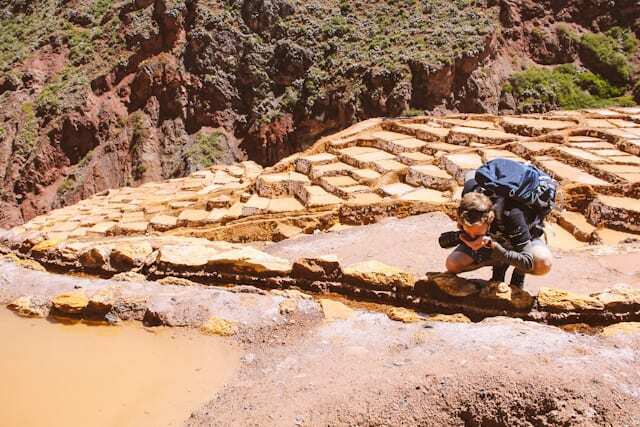 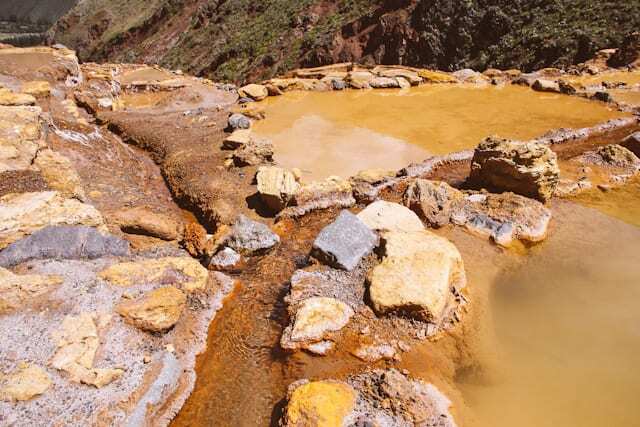 The salt pans of Maras in the Sacred Valley was somewhere we were dying to see! 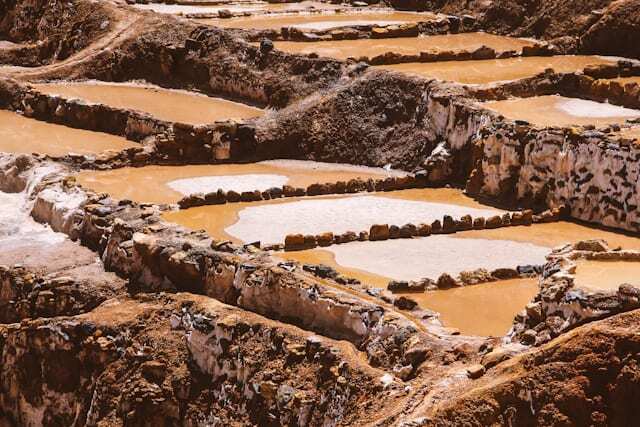 From all the pics we had seen it was a surreal white landscape where farmers had been harvesting salt for centuries. 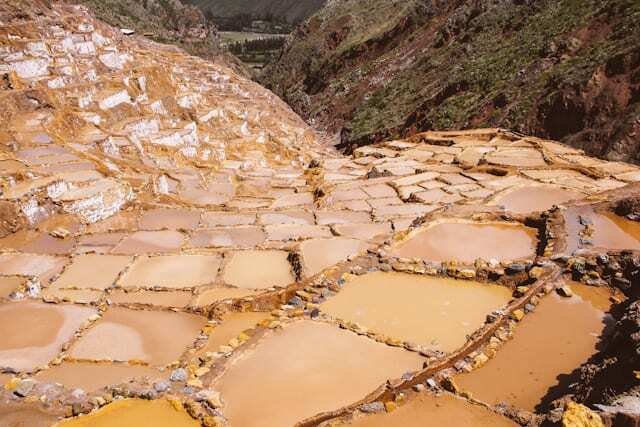 What we didnt realise was during the rainy season(which is when we were there), the sheer white salt pans go orange with the mud that flows down in the rain from the surrounding hills. 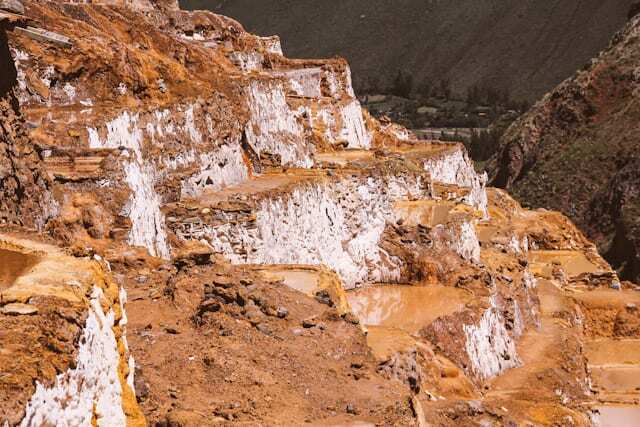 Despite not having the white terraces we had pictured, they were still something remarkable to see in real life and had their own orangey beauty to them! 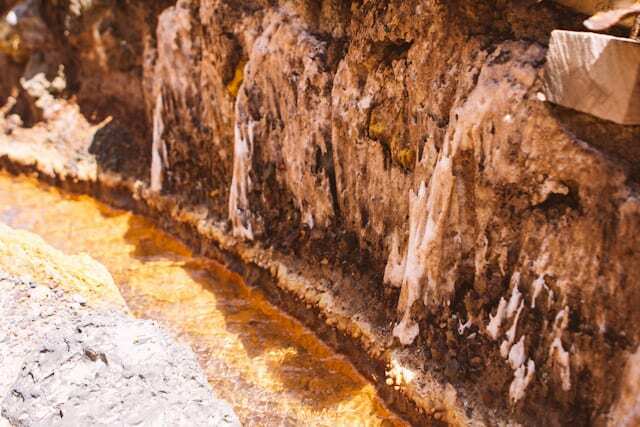 Andy sampling the salty spring water from which the salt is harvested. 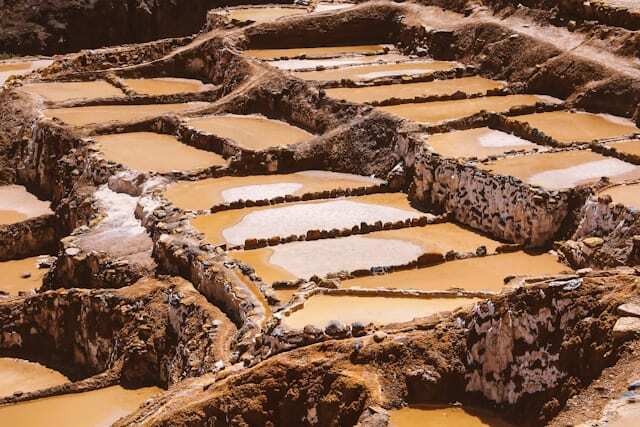 In case you were wondering, yup, it was pretty damn salty! 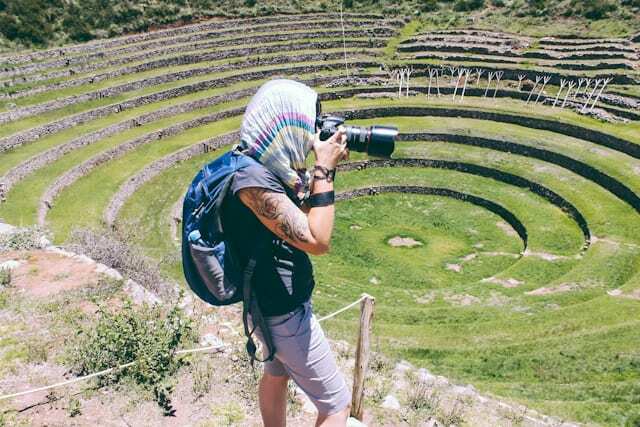 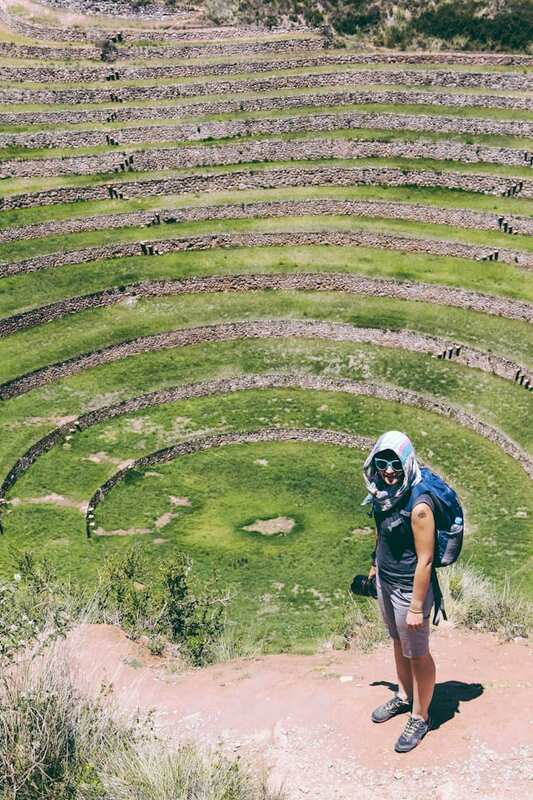 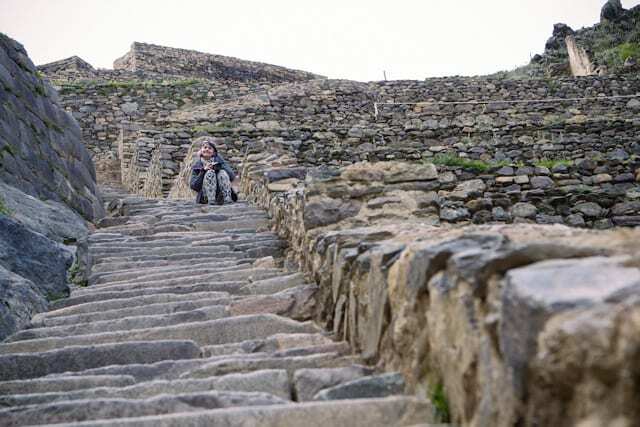 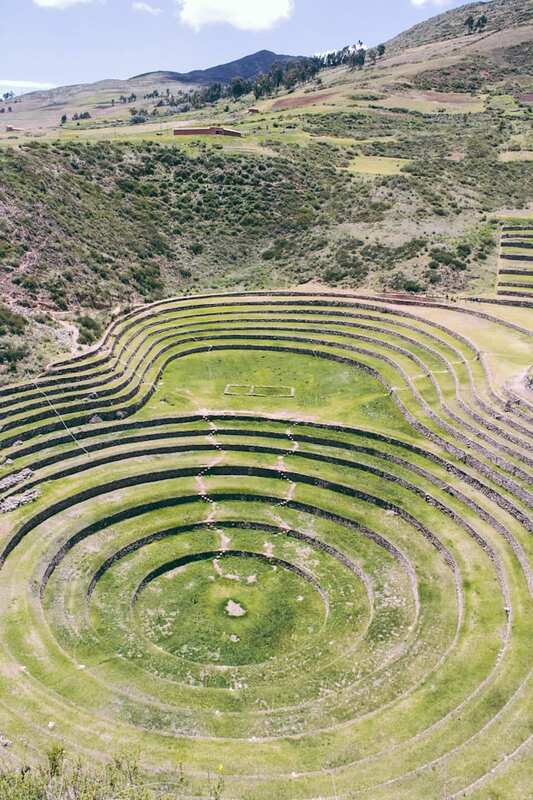 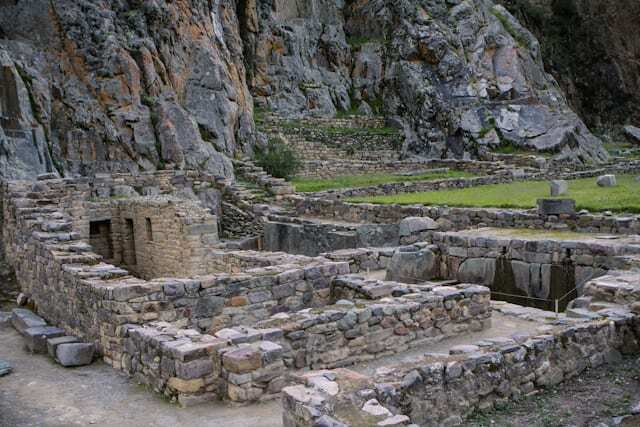 The Incan ruins of Moray were probably some of the most unusual and spectacular that we had seen! 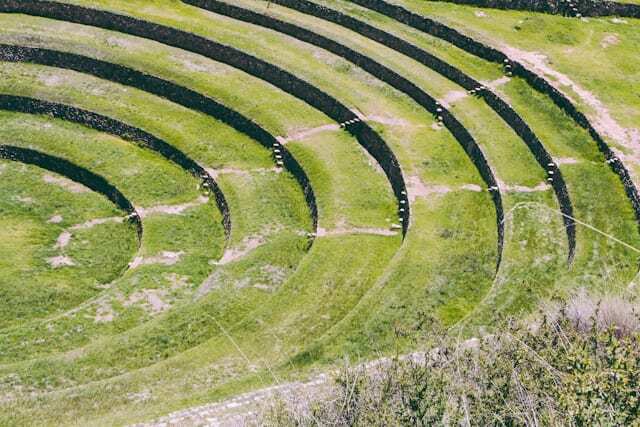 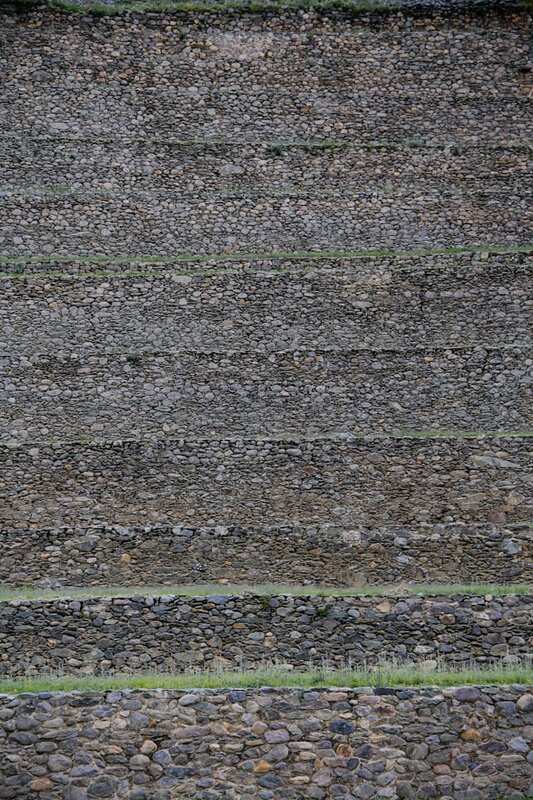 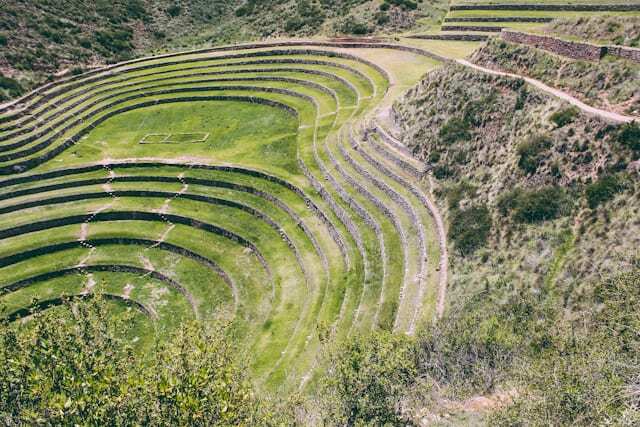 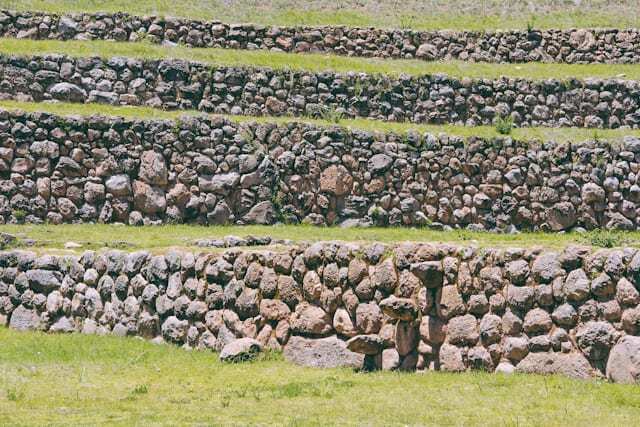 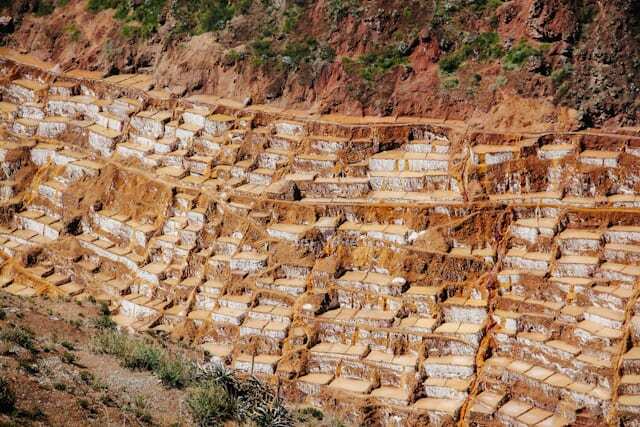 The purpose of this butternut shaped series of terraces is believed to have been and agricultural experiment. 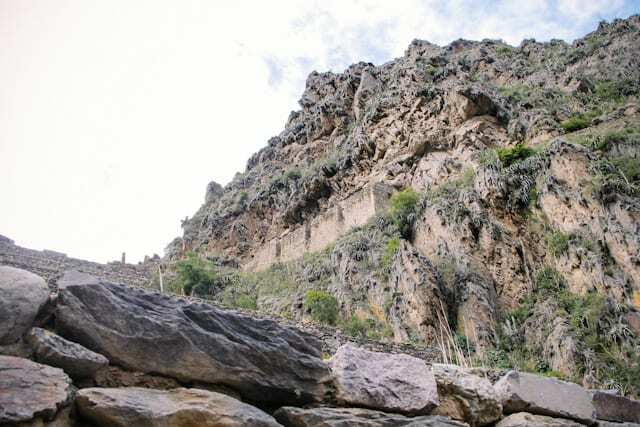 The largest of the depressions is about 30 m deep. 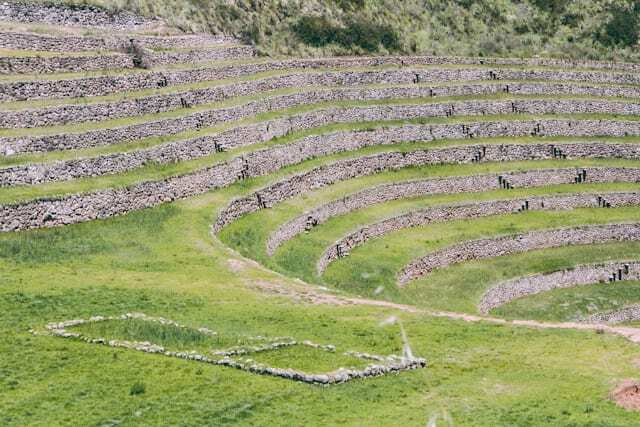 Apparently the depth and orientation of these terraces with respect to wind and sun creates a temperature difference of as much as 15 °C between the top and bottom. 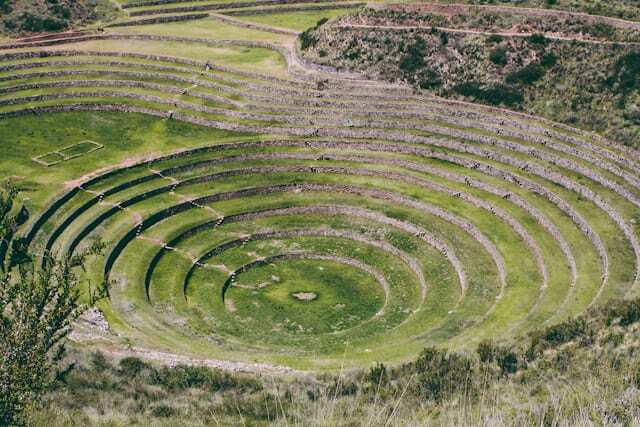 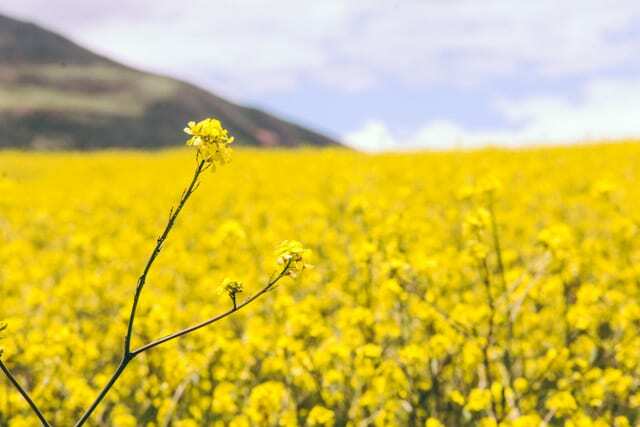 This large temperature difference was possibly used by the Inca to study the effects of different climatic conditions on crops. 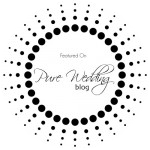 Truly amazing stuff! 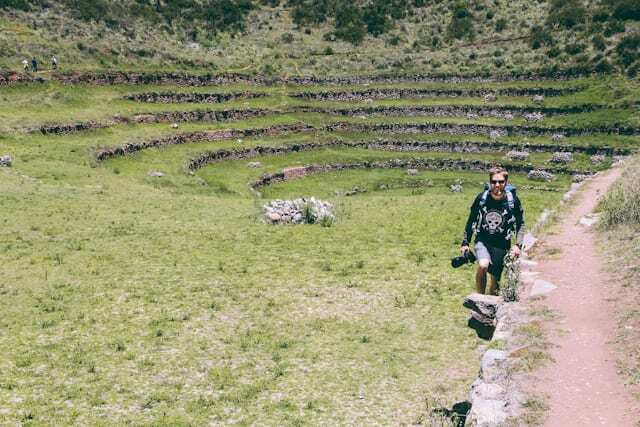 Andy will kill me for putting up this photographic evidence of this hat that he quickly whipped off whenever I aimed my camera in his direction!